Cleanup • Eighty pounds of concrete chiseled out, hauled down mountain. 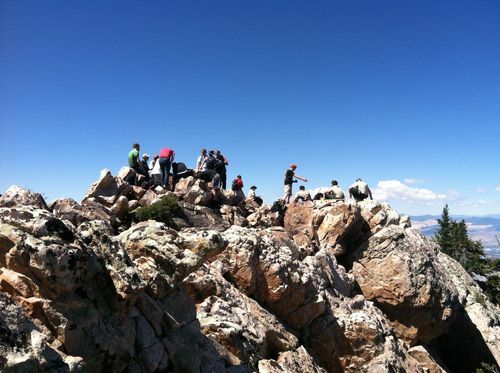 Forest Service employees supervise missionaries as they disassemble a concrete anchor atop Mount Olympus on Saturday, June 28, 2014. The missionaries had erected a flagpole in the anchor, which violates the Wilderness Act. 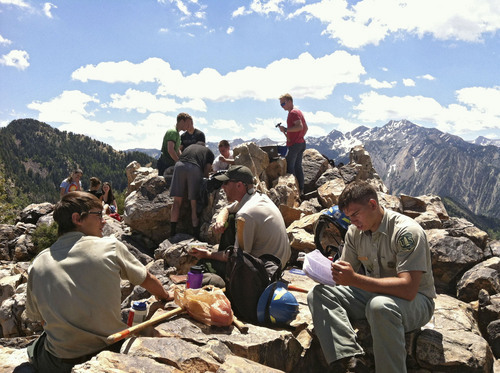 Forest Service employees supervise missionaries as they disassemble a concrete anchor atop Mount Olympus on Saturday, June 28, 2014. The missionaries had erected a flagpole in the anchor, which violates the Wilderness Act. Forest Service employees supervise missionaries as they disassemble a concrete anchor atop Mount Olympus on Saturday, June 28, 2014. The missionaries had erected a flagpole in the anchor, which violates the Wilderness Act. 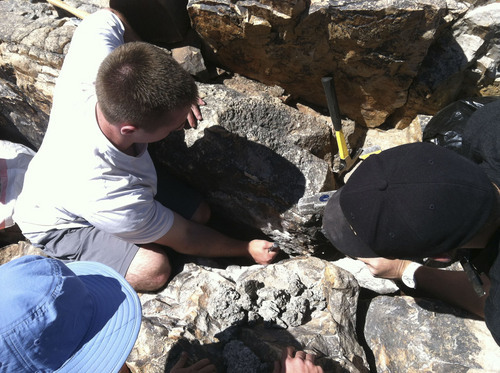 Forest Service employees supervise missionaries as they disassemble a concrete anchor atop Mount Olympus on Saturday, June 28, 2014. The missionaries had erected a flagpole in the anchor, which violates the Wilderness Act. Forest Service employees supervise missionaries as they disassemble a concrete anchor atop Mount Olympus on Saturday, June 28, 2014. The missionaries had erected a flagpole in the anchor, which violates the Wilderness Act. 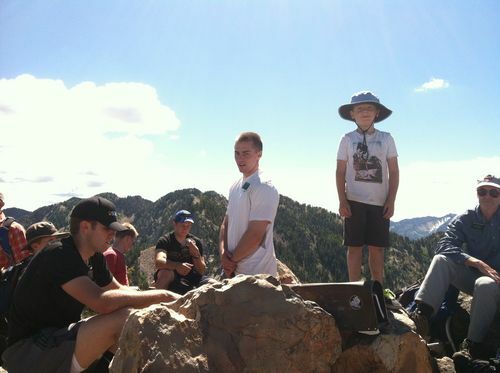 The Mormon missionaries who planted a flagpole in a concrete plug on Mount Olympus last week returned to the 9,026-foot summit Saturday to remove what was left of their unauthorized project. 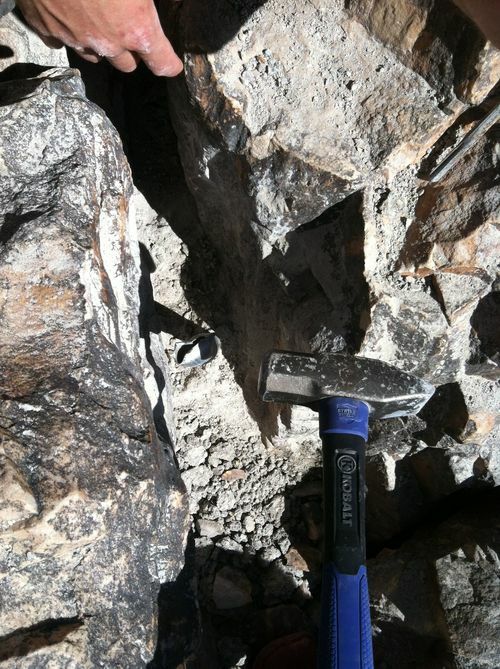 They chiseled some 80 pounds of concrete from the rock and hauled it off the mountain, said District Ranger Cathy Kahlow of the Uinta-Wasatch-Cache National Forest. Although installing such fixtures in wilderness areas violates federal law, no citations will be issued. "They cleaned up what they were supposed to clean up and carried a few other things down that shouldn&apos;t have been up there," Kahlow said. The flagpole bothered numerous visitors to the summit because its presence detracted from wilderness values, even though the mountain top is so close to Salt Lake City and offers expansive views of Utah&apos;s major metropolis. "The good news is people really care about what&apos;s out there," said Kahlow. Before the missionaries for The Church of Jesus Christ of Latter-day Saints returned, hikers had already removed the U.S. flag and mission T-shirt hanging from the pole and broke the pole at the concrete base, which was not so easily removed. "It took [the missionaries] a while to take out the concrete because they used small tools," Kahlow said. Power tools, like any mechanized equipment, are not allowed in wilderness.